There are days when you just need some encouragement. Maybe a word or a hug or a laugh. Days that – for reasons you just can’t explain – are hard. Then along comes an email and a post that just lightens the load, that bears your burden, that speaks truth into your soul. It’s only noon here, and it’s already been one of those days. I woke up just feeling blah. A little put out by the car repair…again. Then BOOM! CRASH! I fell. Right in the middle of Main Rd in Fish Hoek. Well, I wasn’t in the road….but in front of the bank as I was going to pay for that irritating car repair. I don’t know what happened. My slip-slop (not a typo – means flip-flop) just folded over. And I, with no grace at all, fell up – yes, UP – the bank steps. Then two sweet old ladies began speaking. Checking to see if I was okay. No English. Afrikaans and Xhosa (I think). Praise the Lord, I am okay. My left knee and hand bearing the bruises that will fade with time. But my heart aching. Still aching as I type this. But I recovered and carried on to the bank – to pay for that irritating car repair. Home…needing encouragement. A quick texted to Ron revealed that I am not in this craziness alone. A deep breath and a little healing of my heart. Opening His Word to the reminder…”I have fought the good fight, I have finished the race, I have kept the faith.” Paul’s word to Timothy speaking to me. Paul endured prison and a ship wreck and many, many horrible things. Yet, he rejoiced. Can I rejoice in this morning? Then an email and a post from a sweet friend serving in Haiti. 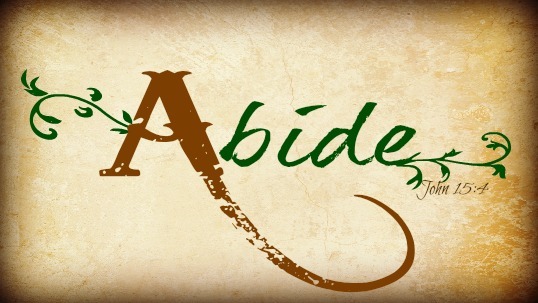 And the word…abide. I love that word. To abide, to stay, to remain! Vivification, Building Faith in Him. Even in this car repair, falling down kind of day, I can abide-stay-remain in Him. And it is okay! And not only can I abide in Him….He abide – remains – stays with me. Even in this car repair, falling down day! This entry was posted in Love 'em like Jesus and tagged abide, blessing, encouragement for missions. Bookmark the permalink.